I didn't find the books until after the movie was wrapped and in post-production. None of them have wormed their way in yet, except Charlie, because I had a very fuzzy picture of him, and Billy Burke was brilliant. But as dearly as I love Robert, and as hot as I think he was in the movie, he isn't what is in my mind when I read Edward in the books (no man I've ever seen is). amie wrote: None of them have wormed their way in yet, except Charlie, because I had a very fuzzy picture of him, and Billy Burke was brilliant. But as dearly as I love Robert, and as hot as I think he was in the movie, he isn't what is in my mind when I read Edward in the books (no man I've ever seen is). 100% agreed. I didn't have a good visual of Charlie either. Billy blew his character out of the water. Bella and the Cullens were a close match, but they still didn't quite do it for me. 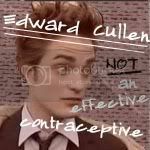 Edward's perfection truly just does not exist... that's why I prefer SM's descriptions and my imagination. Sorry Rob, you were great, but my Edward can't be matched. Thats one of the biggest reasons I dont want to see Twilight... i like the way i have envisioned the characters. Ive just seen the trailers and already i think about those actors when hearing about the books. 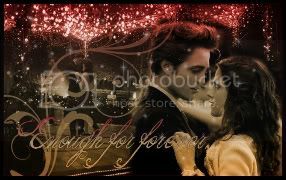 ~.~ About Breaking Dawn... I think they are at least going to attempt to make it.. I mean.. can you imagine them doing allll of the others and NOT breaking Dawn? Fans would be disappointed... I dont know .. i do think it will be the most difficult movie to make, but ill bet they are already thinking about how they want to show it. omg Breaking Dawn as a movie? I'd bring ear plugs for the birth scene. The rest would be awesome though. It's so hard to find the new threads and now it's like 81 pages pass! Right now there is only an "If there is an Eclipse..." thread... because they are only moving ahead one movie at a time. well im all about new moon right now so.. woot woot to new moon. even though this is the twilight thread. ugh im so lost now... i've gotten addicted to the rob thread. it's like my home away from home now. There is a poll on NPR where you can vote for your favorite movie of 2008. Twilight is there, so if you feel inclined go on over and vote! !